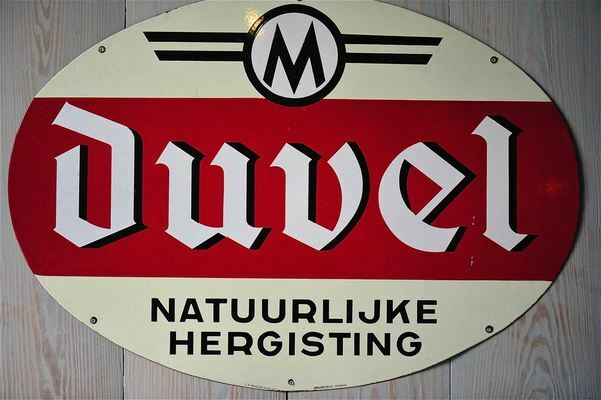 PUURS - Some beers are veritable icons and Duvel is certainly one of them. If you spot a tulip-shaped glass, even without the logo, you will have a good idea of what its contents might be. This particular degustation glass goes all the way back to the ‘flower power’ era of the late 1960s. It holds an entire 33cl bottle but don’t pour out the beer too quickly or it will just turn into airy foam. The glass narrows towards the top and this helps to sustain the immense collar of froth. The design is well thought out too. Look into the bottom of the glass. Can you spot the engraved ‘D’? It makes the carbon dioxide bubbles sparkle beautifully. Artists and other creative people take Duvel to their hearts. 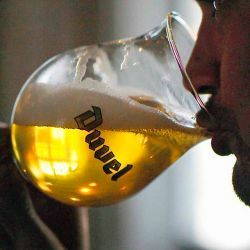 They share their idiosyncrasies with this character beer and a string of famous names have let their creative demons loose on the designs of Duvel Collector glasses. 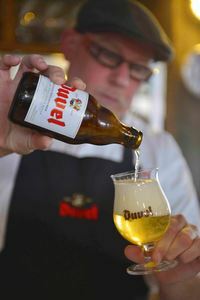 Pouring a Duvel is also an art form in itself. You start off with a clean and dry glass at room temperature. Position the glass at an angle and avoid contact between the glass and the bottle. Start pouring and continue to widen the distance between glass and bottle whilst pouring. Once finished, stand the glass upright to create the luxurious collar of froth. 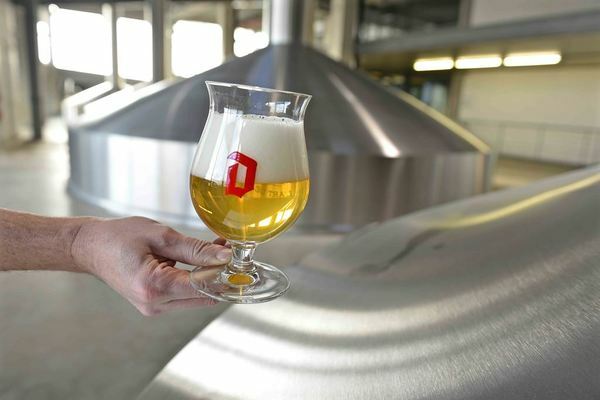 The Duvel logo imprinted on the outside of the glass indicates the ideal point where the beer turns into froth. The yeast at the bottom of the bottle accounts for the extra-bitter taste. It is therefore recommended to not empty the bottle completely but to leave 1cm at the bottom to enjoy a beer with a great balance between a subtle bitterness and a delicate aroma. aroma hops. The beer has the freshness of a pils but has the fragrance and flavour of a specialty beer. Duvel is a strong Belgian blonde beer (8.5% ABV) that re-ferments in the bottle. You can taste a pleasant thirst quencher with a dry but still alcohol-sweet flavour, with a pronounced hop aroma. The beer surprises with the huge foam head, delicate sparkle and soft feel in the mouth. The beer that ends up in your glass has been through an extra-long brewing and maturation period of 90 days. Once bottled, the beer will re-ferment for a ten-day period in the brewery’s warm chambers (24°C). Finally it will stabilise for six weeks in the cold storage chambers (5°C). A few years ago Duvel gained a sibling, the stronger Duvel Tripel Hop (9.5% ABV). 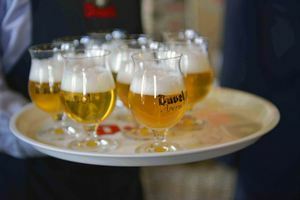 The Duvel Tripel Hop – what’s in a name? – is brewed with three types of hop: Saaz-Saaz, Styrian Golding plus a third variety that varies from year to year. The taste and aroma of a Duvel Tripel Hop is quite different from that of a Duvel. 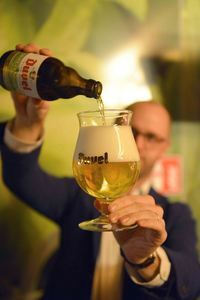 Fans of the original Duvel took some time to get used to it but now they look forward to the new edition of the Duvel Tripel Hop every year. Duvel is a lady of a venerable age. She was born back in 1923. The beer is the fruit of a lengthy search for just the right ingredients. 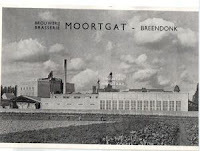 The first generation of the Moortgat family started brewing in 1871 and from the outset the brewers set the bar high. Quality standards were self-imposed that were non-negotiable and quality was never to be compromised. During the First World War, Belgium experienced the influence of Britain and the British ales that were popular at the time. Brewer Albert Moortgat was inspired by this success story and decided to produce a craft beer based on the same model. Albert only wanted to work with the very best ingredients. He made his way to Scotland in search of the ideal yeast strain. To start with, he encountered much resistance from the local brewers. In the end, Albert’s quest culminated at a small Scottish brewery where he found exactly what he was looking for. He was able to lay his hands on a sample of the yeast he had been coveting for so long. Even to this day, the brewers are using yeast propagated from the same strain. Albert Moortgat refused to stop experimenting until he got the recipe absolutely perfect. Under the name of ‘Victory Ale’ this beer heralded the end of the First World War. It turned out to be surprisingly good. At a tasting session with the village dignitaries, the beer released its devilish aromas. This prompted shoemaker Van De Wouwer to exclaim: “This is a real Duvel (devil).”!!! You can taste all this history for yourself.